Traveling means another culinary experience. Traveling means meeting new people. After all I love eating new experiences. What does it means? You can see it all on the photos I took below. Anyway I always thought Padang meals all about Rendang, meat or vegetable with chili sauce and coconut floss. But after this Padang ‘Rendang’ Trip, my view to Padang culinary a little bit different. I never thought will gonna eat this Durian Ice Cream/Soup/Ice at Padang because my mission only for Rendang (Ha!). Padangnese surely have good sense of humour. You have to check this places either Es Durian Ganti Nan Lamo (Translation: This is Durian Ice from The Old One) or Es Durian Iko Gantinyo (Translation: This is The New Durian Ice). There is story behind the name of these ice cream shops, apparently the owner split up and make a new shop. I am not sure which one is the original one though, but everyone is convinced both of them have much tastier ice cream. Padang panjang city and it’s Sate Mak Syukur. 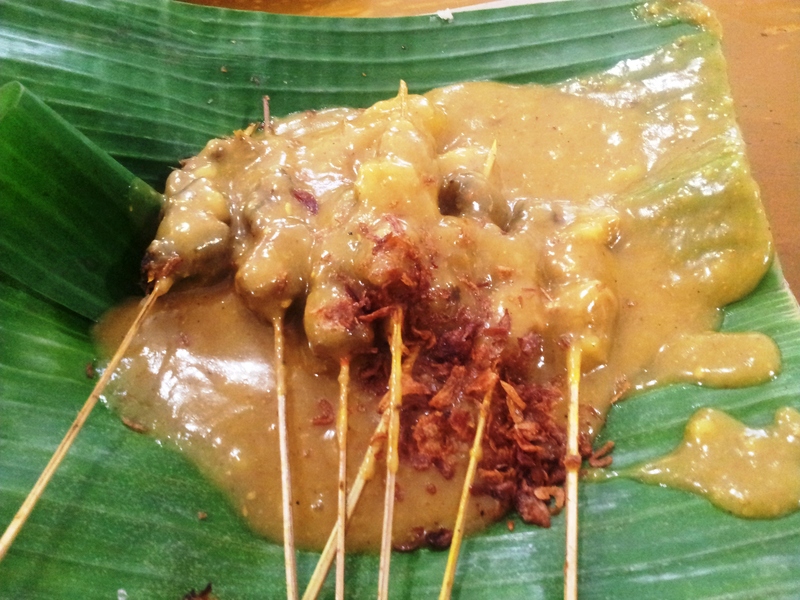 You will never beat the taste of original Sate Padang and its rich taste from buffalo meat an spicy sauce. Never ever miss this place if on the way to Bukit Tinggi (!). Funny notes if you eat at this place sometimes you have to share your table with strangers especially the restaurant are full with people. Imagine your dinner table at home and you have to share it with strangers. They are not only one but might be more than 4 people, it would be super strange huh? I feel like that at first. Besides Teh Telur, you may want to taste Kopi Telur (by the way they pronounce it as Ko-pi Ta-lu-a). Yep! It is coffee with eggs. Although at first seems weird, It’s a traditional red bull to enhance stamina and reduce tiredness. The tea version is almost the same one but with a very dark tea. I love both tea and coffee version definitely and keep ordering them while still at Padang and Bukit Tinggi. There are actually another recommendation if you want to do culinary trip around West Sumatra such as Soto Garuda, Martabak Kubang Hayuda, Keripik Balado Christine Hakim, Keripik Balado Shirley, etc. West Sumatra definitely not a good place for a vegetarian and vegan (besides Makasar, South Sulawesi), I almost couldn’t find any un-meaty and low cholesterol meals here. Well as I said I am a 3/4 vegan on About Me means my 1/4 diet style will include protein diet such as meat, fish, and its derivative. I wouldn’t say I am completely a vegan because still eating them in small portion and avoiding them as much I can. As part of life experience, being a full vegan or vegetarian is a brave thing to do. I am still struggling to be one of them since must diversify and creative to find, make, or buy meals supporting to this diet. I believe being a vegan is the best one as being vegetarian is okay although still drink milk and eat eggs also cheese. Well I guess I will talk more on this later on. OK, like I told you all before this would be my last posting on Padang Trip. Hoping everyone enjoy all of them. Until the next post and next trip! See you again, Folks! wuaaahhhhhhh, sukaaaa banget sama tulisannyaaaa.. kerenn.. thanks to be my travelmate! !